To help celebrate the arrival of a weekend my Mother would occasionally come home from work on a Friday night with a brand new and unopened jigsaw puzzle. Sometimes they would be as large as two thousand pieces. It would be delegated to the kitchen table and opened immediately after dinner. Then the fun will begin. Even as a young child I was allowed to participate. My first task on the Friday night would be to find all of the end pieces. End pieces consisted of a jigsaw puzzle piece with one or two totally straight sides and these pieces would make the outside frame. Corner pieces, were especially prized. I performed this task efficiently and I performed it well. That evening, I would always go to bed content because all of the outside pieces had been found and set in place as well. We would meet up the next morning to work on the puzzle over toast, cereal and coffee. It was then that I was put in charge of finding all the blue sky pieces. The puzzles that Mother chose usually consisted of a beautiful mountain scene with a little village on the side. Now that I think about it I have always been fond of mountain vistas. My father was usually the one who put together the sky pieces. He seem to have the meticulous nature that it took to do so. Further, he had the most patience. And so we spent the day around the kitchen table. At some point in the afternoon a bowl of potato chips would be introduced. If I had been happy in my place as a useful participant, I was now extremely happy and well snacked too. If anyone came to the door as sometimes happened, they were invited to sit down and join us. After I had found all the blue sky pieces I would then be asked to separate the rest of the colours. There would be brown and green for the mountains, white for the clouds, royal blue for the water, and the red and yellow pieces usually denoted tiny little houses and chalets. By the time I went to bed on Saturday night I would usually cast a weary eye at all the pieces that yet remained unsorted. Would we be able to get them all put together by Sunday night’s dinner? Hopefully, we had not lost any pieces. Tomorrow would tell, I thought as I headed towards the stairs to go to bed. We resumed at the table Sunday morning. Sometimes, conversation, housework, laundry or a long phone call would put a hold on the puzzle’s progress much to my chagrin. I wanted less talk and more puzzle action if we were to finish. …and always before dinner the last piece of the puzzle was finally placed and we all breathed a sigh of relief. Then we would ceremoniously transfer the puzzle to the spare upstairs bedroom where we kept Father’s movie projector, reel to reel tape recorder and Mother’s fat burning jiggle machine. Of course there were a great many other finished puzzles that we had already completed on the desk, on the floor and on the couch. Last May while my Mother was in hospice during her last days, the Interval House kept a beautiful puzzle on the table by the front window in the parlor. I welcomed being able to sit there and maybe find a piece or two during the moments that the medical staff were tending to Mother’s needs. It was such a comfort. The last day that I stayed at her apartment right after she had died I found another puzzle table near a back door entrance of her apartment building. I can’t help but wonder if Mother ever knew that it was there. Had I known it was there I might have spent some time sorting out a few pieces rather than sitting alone in her apartment. About two years ago I rediscovered jigsaw puzzles, except these were the downloaded apps for my iPad. They have a tremendous assortment of scenes and themes. It’s a good feeling to know that I can never lose a piece. To be honest, I really miss the old-fashioned puzzles, like the feel of the little cardboard piece in your hand and the comforting little snap when it’s put in place. And make even more puzzling memories! My Mother was a very competitive woman. Years ago, whenever I would phone Mother and Jim, I would always get the rundown on who was ahead at mahjong that day and even what their stats for the week were. Anyone who has ever played pinball with Mother also knows that the pinball wizard Tommy himself would have nothing on Mother when it came to replays. And how many days and nights did Frank and I spend with Mother and Jim scheming, laughing and teasing one another while playing Hearts, Uno, and Milles Bornes. Those were the best of times. I believe I was at about level forty-five while when I was visiting Mother a little over a year ago. We were having a quiet afternoon. She was playing on her computer, while I was on my iPad. “What are you playing,” she asked as she played her favourite game, Bejewelled. The week after I returned home, she had already passed me and was in the lead. What had taken me four months to achieve had taken her less than two weeks. As hard as I tried, I could not catch up with her. But before I knew it, she again had an embarrassing lead over me proving that I was way out of her league. Everyday Mother would send me more and more lives, and every night when she called, she asked if I had received them and by the way, how was my Candy Crush game going? Every now and again she’d complain that she’s been stuck on a level and how it’s driving her crazy, and then she’d add how much better I was getting at the game. I resigned myself to the fact that I would never reach her when she reached level 285 and I was only at around 200. But I kept playing because I knew she loved playing cat to my mouse. If playing it brought even the remotest joy to her day, then I would be a good sport and do my best get as close to her as I could. In April though, I noticed that she had been at level 340 for a little too long. I attributed this to her pain level and medications. Then of course came the realization that she would not ever be advancing to the next level. After she passed away in May, I could not bring myself to playing Candy Crush. In fact, I was seriously considering giving up the game altogether. But, that is not how this story ends. Eventually, about a month later, I did open up the game and began working myself towards where her pretty avatar waited on the screen. 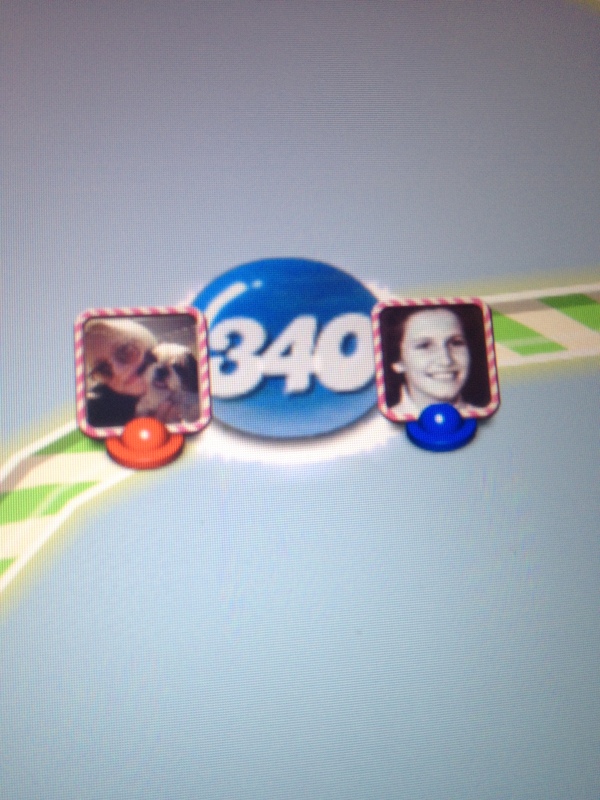 And then came the day when I finally reached level 340, and our avatars were side by side. Again, I thought of leaving the game there. But then I thought better of it. After taking an onscreen snapshot of us side by side on the Candy Crush game board, I made my way out of the Candy Crush train station and left her behind. She would have wanted it that way. However, moving on in real life without her has been a little more difficult. There are days when I could use a several of those pretty boosters to give me a bit of a zap. I’ll make my way out of the station one of these days. Mother would have wanted it that way.